The Labor of Love | Choose Your Energy: Change Your Life! Granny lived her pray/work maxim with every fiber of her being. She was a woman of great faith AND she was a hard worker. Granny only made it through the third grade when she had to quit school and go to work to help support her family. After her church organist husband ran off with her best friend, she worked tirelessly to raise their three children on her own. During the Great Depression, she took in her adult daughter and granddaughter (my beloved Nan and cherished Mother), along with her adult son and grandson (both of whom suffered severe alcoholism). At some point, I believe she also took in her other adult daughter and grandson. The legacy of strong faith coupled with hard work is one she, and many of my other ancestors, passed on to my brother and me. You may legitimately level a variety of criticisms at members of the Wells tribe, but we are each people of faith (though the specific forms vary) and none of us are slackers. On the contrary, our difficulties are found in the realms of overworking and overdoing without sufficient respect for the value of rest, reflection and play. So what about this question of praying as if everything depends on God and working as if everything depends on me? Abundance is available to each of us 24-7. We don’t earn it by good works or even hard work. The question is whether we choose to ignore or thwart it out of cluelessness or fear, or to access it freely on demand through mindfulness and willingness to align our core energy with the essence of God within us. When we are aligned with unconditional love, respect, curiosity, compassion and gratitude, our every breath fosters generous, effortless, gracious flow filled with faith, hope, prosperity, peace and joy. Prayer and meditation aren’t about convincing or begging God to get on board with your agenda. They’re about fostering your alignment with the essential Divine agenda already dwelling within you. True prosperity is not about material wealth—material wealth is ephemeral and illusory at best. It comes and goes. True prosperity is about the treasure within—the one which endures and is worth so much more than gold or precious gems. So where does hard work come into the picture? When work is fueled by love, respect, curiosity, compassion and gratitude, we demonstrate our alignment with the essence of the Divine. That alignment helps us to play our part in revealing and advancing the highest good. Through love-fueled work, we embody the Divine here on earth in human form—the hearts, minds, hands and feet of God. In that sacred space, we allow ourselves access to the full array of God’s wisdom and grace, so that we may paint with the full palette of God. But when we choose to fuel our work with fear, contempt, shame, competition and a sense of limitation and lack, we miss the mark. Having chosen to forget the nature of the indwelling God, we block ourselves from accessing the Divine wisdom, creativity and power within us. We lock God’s palette in a closet and lose the key. Temporarily. Because all it takes to escape that hamster wheel approach to life is to realize that our thinking has become fearful and small, become curious about the limiting beliefs fueling those illusions and embrace them with compassion for our humanity. Then, having found the key again by remembering that we are spiritual beings choosing to have a human experience (not human beings reaching about in the dark for a fleeting spiritual experience), we remember who we are and Whose we are. We realign our energy with God’s energy and regain access to faith, hope, prosperity, peace and joy. In that state of grace, we know once again the optimal answers to the ever-present questions of what to do, why, when, how, how much, with and for whom. When we choose to live as expressions of the Divine here on earth, we freely give and receive, so that all may live in harmony, prosperity and love. Once restored to that state of grace, we also remember that not taking care of ourselves demonstrates the greatest disrespect for the Divine gift of human life. If we value the opportunity we’ve been given to be spiritual beings having a human experience, we will do everything in our power to cherish and care for our human “vehicle” mentally, physically, emotionally and spiritually. The owner’s manual advises that we nurture, encourage and delight ourselves in healthy ways. Because, when we don’t take care of ourselves, eventually we’re no good to ourselves or anyone else. We can give nothing of significant and lasting value from an empty well. Nutrition, exercise, rest, reflection and play are as important to the purpose of our presence here as the activities we more typically label as “work.” They are equally important aspects of the jobs we’ve been sent here to do—manifesting our unique forms of Divinely sourced greatness. So, Madam Prime Minister, if your use of the term “heaven” is meant to be a synonym for Divine supply, then I respectfully beg to differ with your conclusion. 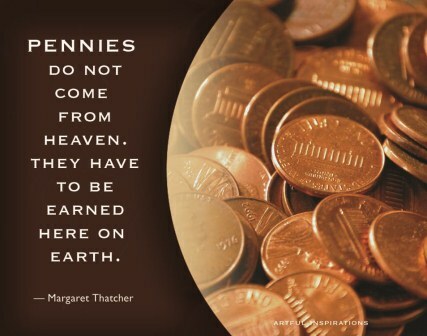 The only pennies with any lasting worth for me are the ones that are sourced in the Divine. My ability to access those pennies and other forms of Divinely sourced abundance, is grounded in my ability to align myself with the core attributes of the Divine. And then to demonstrate my gratitude and respect for my role by discerning, focusing and following through in each moment. Whatever my circumstances, my job is to remember who I am and Whose I am. I am a unique cocreative expression of the Divine. How could that ever not be enough? Show up, bring your “A” game, trust God with the details! May you grant yourself time for rest, reflection and play on Labor Day and every day. You are a precious natural resource not to be taken for granted. You are the only YOU we’ve got. Behave accordingly! This entry was posted in All My Blog Posts, Authenticity & Purpose, Creativity & Self-Expression and tagged Deborah Jane Wells, How to de-stress, How to stress less, What is abundance, What is authenticity, What is burnout, What is creativity, What is faith, What is gratitude, What is hope, What is life purpose, What is my life purpose, What is perfectionism, What is prosperity, What is spirituality, What is stress, What is stress management, What is the meaning of life, What is the purpose of life. Bookmark the permalink.